It may offer a functional distribution of Linux, but the Linux kit for PlayStation 2 is also very much about making PlayStation 2 hardware accessible for learning how to develop games, and in the past year that the Linux kit has been available, we are pleased to say that several universities in the US, Europe, and Australia, and other educational groups have introduced Linux for PlayStation 2 facilities and teaching modules as a part of their degrees and courses. This area of the site is dedicated to news and information about universities and other groups that we know of that are using the Linux kit for teaching graphics, console game development, and other related material. US & Canada: The North American territory is now sold out of Linux for PlayStation 2. Ian Stephenson of Bournemouth University will be presenting a Technical Sketch on implementing RenderMan on the PlayStation 2, which he has been working on using Linux for PlayStation 2. The session featuring his sketch is at 3:45pm on Wednesday 30th July - if you'll be at SIGGRAPH, check it out! More information about the "Hardware algorithms" session is available here on the SIGGRAPH website. Ian's code is also available under the "Adam" project. Tuesday 24th June saw the official launch of a new MSc course developed by Sheffield Hallam University, especially designed to meet the growing demand for skilled developers familiar with console development, and working within the video games industry. At the launch event, Ray Maguire (Managing Director of SCE UK) and Paul Holman (VP Technology of SCEE) were present to congratulate SHU on successfully launching the course, and confirm our support. The students will be working using 20 Linux for PlayStation 2 kits for the practical elements in the course. The first students will enter the course in September 2003; the first graduates will complete in December 2004. More information about the course, including application details, is available at their website. On Monday 9th June, Abertay University held the opening of its new Linux for PlayStation 2 studio, a new facility which will be available to students studying their Computer Games Technology course. Paul Holman, (VP Technology of SCEE), and Sarah Ewen, (Linux Evangelist at SCEE) visited Abertay University for the opening. Paul Holman conducted the official opening ceremony, and the plaque that was unveiled will be mounted by the Studio to commemorate the occasion. The studio was possible through continued support from SCEE. 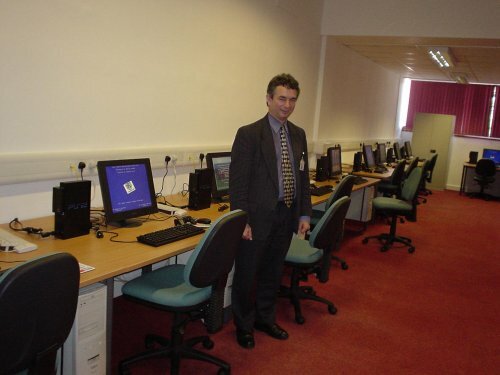 In 1998, Abertay opened one of the first Net Yaroze facilities accessible to students. For more information about Abertay's course, a description is available on-line in PDF format here. A press release from Abertay University about the opening is also available here. The National Center for Supercomputing Applications have launched a cluster of PlayStation 2 units, which they intend to use to explore the possibilities of high-speed computing on relatively inexpensive hardware. Their press release is available here, and the project has its own website on-line here with more information. We'll add more information about Linux kits in educational organisations as and when we can. The last update was on Tuesday 1st July, 2003. If you are interested in introducing Linux for PlayStation 2 to your course, please contact us.